I don’t write in my Bible anymore. I used to do it all the time. But I kept running out of room in the margins. There’s such a conversation going over time that even cryptic notes are too much for the slim margin space. Oh, and don’t start about the bigger spaces at the end of chapters. Or the blank space around the new chapters. I’ve used those up, too, covering the white with my “Yes!” and “and not only that but…” and “c.f. [another idea or reference],” and “Paul, would you just give it a rest.” I’ve entered single words to record miracles or sadnesses I’ve known. Sometimes just a name. I know what it means, and one word can pierce my heart, opening me again to joys or sorrows. I’ve had to buy new Bibles because there was no more room to write. So, I don’t write in my Bible anymore, but I do insert cards with notes. 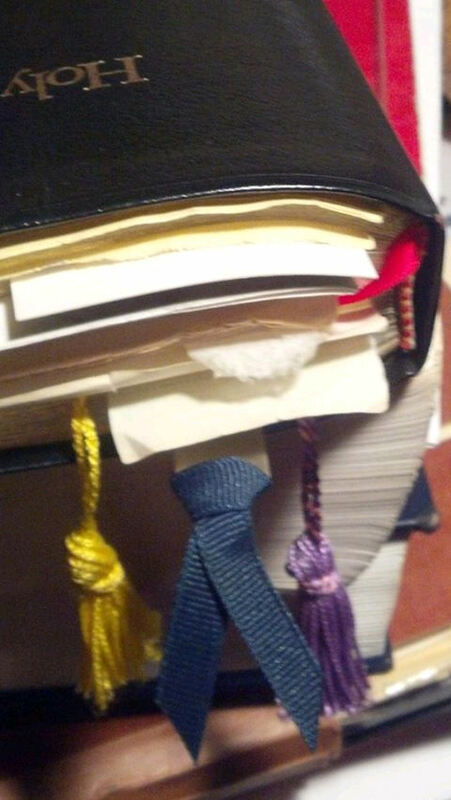 It is almost humorous, this, because instead of taking up all of the margin space, my cards and slips of paper are threatening to break the binding. And doesn’t that tell us something? That the word of God just won’t be bound. Won’t be limited to this volume sitting on my lap. And so I’ve learned. The story is always new, always unfolding, never just the stories in this Bible that I’m holding in my hands, even those I’ve added in over the years. The heft of it, this book of written words, is nothing compared to what our hearts receive. All my margin scribblings, and cards and papers with notes – and yours – unbind the binding, and continue the story that’s just begun between the worn covers of any bound volume. “the word of God won’t be bound!” love.